Why plan? Because planning creates a path to big changes and big successes. Winging it is a strategy that has its time and place to shine, but planning is a good idea most of the time. Can you imagine going in for a haircut and telling your stylist to start chopping and go wherever the scissors take her? We do this same thing all the time when we go around from day to day wherever the wind takes us. Sure, that sounds like a great vacation, but I don’t know anyone who doesn’t have appointments to keep and things that need to get done in real life. Last January I wrote a post – 5 Ways To Plan Better. I still agree with all of those tips – imagine that. The advice there includes very practical ways to use your planner better. Using a planner in the typical way will help you get your chores done and make all of your appointments, but there is a higher level of planning that can take you even further. This is the planning that creates big change, the planning that gets us out of our ruts. Stop now and picture a change you’d like to make in your life. Do you want to get organized? Lose weight? Strengthen a relationship? Serve more? Develop a new talent? Check something off the bucket list? Maybe you want to declutter? Pause now and focus on that change: what will it look like and what it will feel like. I love what Steven Covey said about this: “Start with the end in mind.” Now is the time to get your mind straight about where you want to be. Once you know what the end looks like, make it happen with good planning. Plan backwards. If you want to create a home environment that is peaceful and easier to maintain, you’ll want to do some decorating to create a peaceful mood. Decorating in a mess is no fun, so you’ll need to cleanup first and get organized. It doesn’t make sense to organize clutter, because it will not stay organized, so the first thing you’ll need to do is declutter. Whatever your goal is – look at it backwards and it will appear more do-able. Now, this is where the planner comes in. When you have a high level plan, use your planner to break your plan into small manageable pieces. Write those sub-goals into your planner and follow your plan. Crossing those things off while you go is sooo rewarding! I know it sounds like I might be over-simplifying this, but it really is this easy. You may be making this too hard on yourself. In your planner, your appointments, chores, and errands should be listed right along-side tasks associated with your goal. Your plan to make your life better needs to be a part of your daily life in order for it to really happen. And just because those other things on the to do list might feel more urgent, they are not as important. Keep reminding yourself that! 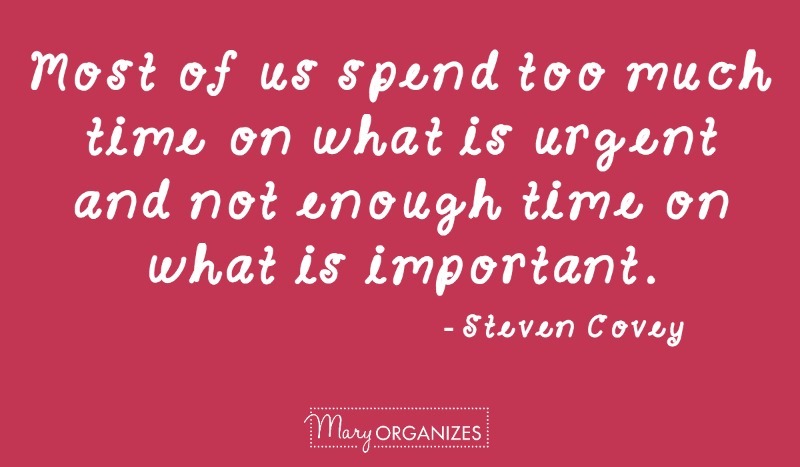 Steven Covey said that “Most of us spend too much time on what is urgent and not enough time on what is important.” We are all guilty of this, which is why we all need the reminder and why we all need to plan. Why Plan? So the important things get done! Thank you. Your message is just where I am. You are speaking to me. Thank you. Where’s the blog to follow for the 13 weeks challenge? This is the blog where you are reading this blog post. The declutter posts will be published right here. Lovely tips here. Having a plan is something that seems obvious, but you’d be surprised at how few people really commit to sitting down and doing on a regular basis. Making a time to plan out things is important!